On the Salmon River here in Idaho we’ve had a warm fall. Historically when this happens the steelhead blast through until they hit cooler water and ultimately slow down. Fortunately, conditions have changed in the past two weeks, which has lent a hand to an improved steelhead bite. Roughly, two weeks ago the Salmon blew out, which left it high and muddy for about a week. Be happy you weren’t here for that. Fishing was tough. Meanwhile, as the water started dropping, it cooled and fishing eggs turned on. The steelhead have been gobbling them up ever since. This time of year is usually shrimp oriented, but due to the water conditions we’re facing I think this egg bite is going to be very good, even better than we’re accustomed to. With the water being off color, as I’m expecting it will be on and off for a few weeks, the scent eggs yield when they milk has been a path to success on my boat. Obviously, it depends on angler skill, but it’s not uncommon to see 10-15 fish a day, which is pretty darn good. 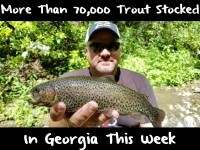 Steelhead are running in their typical 5-8 pound model A-Run fish with a few 16-20 pounders mixed in. I’m fishing the stretch of the Salmon River from White Bird to Vinegar Creek, which is about 70 miles of river. The nearest city to us would be Riggins, Idaho, which is roughly 20 miles from Vinegar. Even though we are in a remote area, plenty of anglers utilize the fishery. We see an influx of people from the Treasure and Boise Valley and some from Lewiston, too. November is solid steelhead fishing for us. This is when we start seeing our larger fish, up to 40-inches. 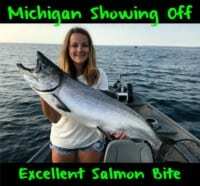 Everybody classifies the Salmon River as an A-Run fishery with lots of 20-22 inch cookie cutter steelhead around, but in all reality we do see some of the larger fish in the state, too. Even though most of the larger fish in this section are wild, a few are hatchery fish. Right now I’m not fishing shrimp because of the water conditions. The water has been too dirty to run shrimp, which is normally my go-to bait this time of year. We’ve been getting blowouts upriver from the old fires and there’s been too much color in the river. I’m fishing eggs right now. Pink BorX O Fire has been the hot ticket. On the other hand, I’ve started mixing some FireCure in with the BorX O Fire the past few days and the fish are hammering it. As it clears up we’ll switch to shrimp, but I don’t see that happening anytime soon. November is going to be an egg bite. Conversely, it’s important to monitor clarity. If water color suddenly changes, I’ll alter my bait. When the water has a tinge to it the fish gobble the eggs up, whereas when it’s clearer they want the shrimp. Locating steelhead, and trout, isn’t going to be too difficult. They are going to be in the deeper tailouts. When the water was warm we were seeing them in the riffles and the runs, but now we are seeing them in the slower moving, deep water. They maintain this pattern for a few months. Editor’s Note: Homer Brown is the head guide for Killgore Adventures. 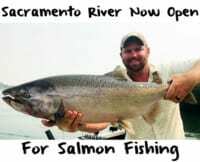 For more info on his scenic Snake River steelhead trips please visit http://killgoreadventures.com/.